Oh my goodness. Are you ready for the best apple crumble you’ve ever tasted!? Prep time – 10 min. Bake time – 50 min. 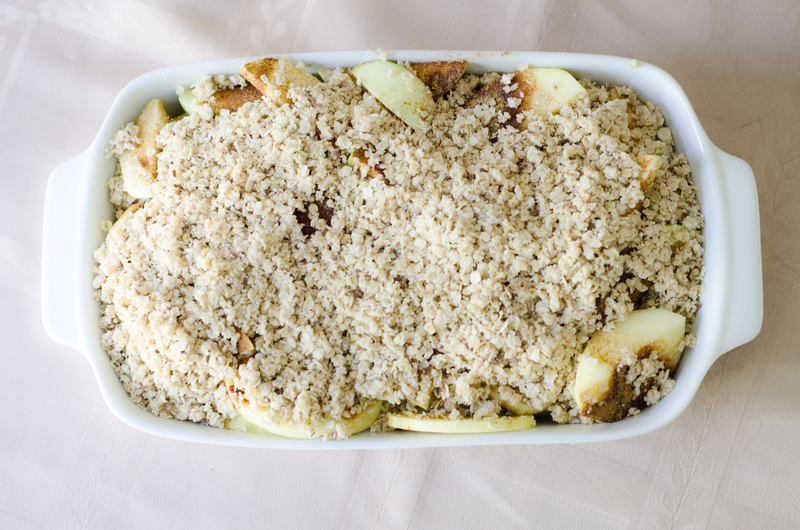 Coat the bottom of a baking dish (whatever size suits you just big enough to fit all the apples) with coconut oil. In a bowl mix together 1/8 cup of sugar with the cinnamon and sprinkle on top of the apples. In a blender (optional but preferred) blend half of the oats until it becomes a flour. Add the flower, 1/2 cup of remaining oats, 1/8 of the sugar and 4 Tbsp. of coconut oil into the mixing bowl and with your hands blend together until crumbly. Add the crumble mixture on top of your apples. Stick it in the oven between 40-60 minutes or until apples are soft.